How would you respond if you received the worst news you could imagine? We spend our whole lives as Christians preparing to respond with faith in the good news of Jesus to carry us through any trial and tribulation. But until we get that knock on the door or desperate phone call, we can’t be completely sure what thoughts would come to mind or what words would come out of our mouth. Cameron Cole knows how he’d respond, because he got the worst news he could imagine on November 11, 2013. That’s when his wife called to tell him that their 3-year-old son, Cam, had died. 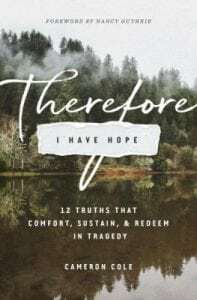 Cole recounts his reaction and applies biblical wisdom and empathy for all of us in this fallen world with his new book, Therefore I Have Hope: 12 Truths that Comfort, Sustain, and Redeem in Tragedy, published by Crossway. Cameron Cole serves as director of youth ministries at the Cathedral Church of the Advent in Birmingham, Alabama, and as the chairman of Rooted, a ministry dedicated to fostering gospel-centered student ministry. He also co-edited Gospel-Centered Youth Ministry: A Practical Guide, published by Crossway along with The Gospel Coalition. He’s been one of our best-read regular contributors at TGC during the last five years. And he’s a good friend of mine who has taught me more than he could know. He joined me on this episode of The Gospel Coalition Podcast to discuss these truths that comfort, sustain, and redeem in tragedy.